(Annapolis, MD)- The Chesapeake Bay comes alive in the fall when the weather gets a little cooler, weather fronts start moving in faster from the west, and the winds increase significantly. For Chesapeake sailors, it is their favorite time of year to sail on the Bay, often with warm waters and big breeze. We got a report from J/88 owner Bill Walczak, sailing on his beloved HORNET. Bill commented, “in the last four races, we got three 1sts and a 2nd. We had up to twenty-four boats racing in PHRF A2 class. HORNET stung them all! 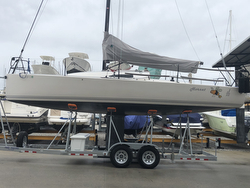 The J/88 is a really fun PHRF platform! Here is what happened in each race. Annapolis to Oxford: we had 18-23 kts downwind for 16 miles then reach with 3 mile upwind, 30 miles. That race was a scream, nearly a full-on plane for most of the race! AYC race to Oxford: it was light; we had 3-6 kts abeam and downwind. We were 4 miles ahead of 14 boats in class when the RC abandoned the race, such a bummer! We were 1/4 mile from the shortened finish! That was our first ultralight air race and were all surprised how well our J/88 HORNET performed. AYC race to Solomons: it was another windy race. We had 20 kts plus for 40 miles downwind, then we reached across the bay to the Pax river and finished. We won by 5 seconds corrected for the Overall win and crushed our A2 Class. We have been lucky with downwind planning conditions, but other planning boats have not kept pace with us. Last year race to Oxford we had 17 miles upwind and struggled against the Navy 44s. However, once we turned the mark to reach off with a code zero, we simply took off and finished first by 6 seconds overall and won class. Very fun boat! Love it! !” Thanks to Bill for his enthusiastic report from his experiences sailing on the Bay! Add to Flipboard Magazine.